You can download a copy of the original plan by clicking the image below. 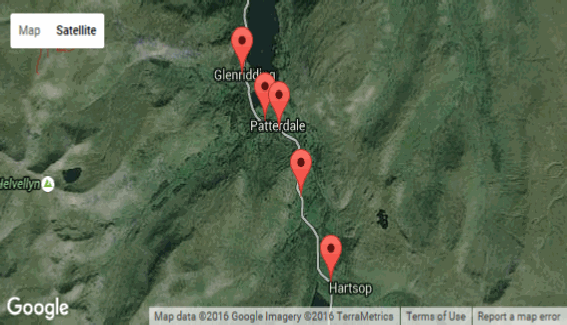 The group is formally set up as a task group of Patterdale Parish Council.. You can also see more up to date information on each area by clicking the map below. 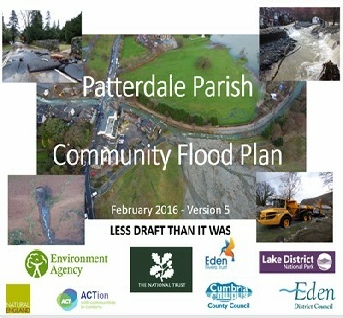 The Patterdale Parish Community Flood plan aimed to identify all the issues we faced in December 2015 from Glencoyne, through Glenridding and Greenside, up and down Grisedale, in Patterdale, Deepdale and Hartsop. There were over 70 issues listed, alongside the actions that had already been completed and the jobs still to be done. The original plan can be seen further down this page, as well our Community Flood Risk Management Toolkit, and a presentation we gave at the North West Regional Floods Conference in July 2016 , and the updated Feb 2017 plan for our Pilot Resilience Project. The current open list of jobs can be seen on the Latest Action Plan. We organised the group into different teams looking at each area, as well as future resilience planning, help with grants and flood defences for individual properties and businesses, upstream management and ongoing maintenance. 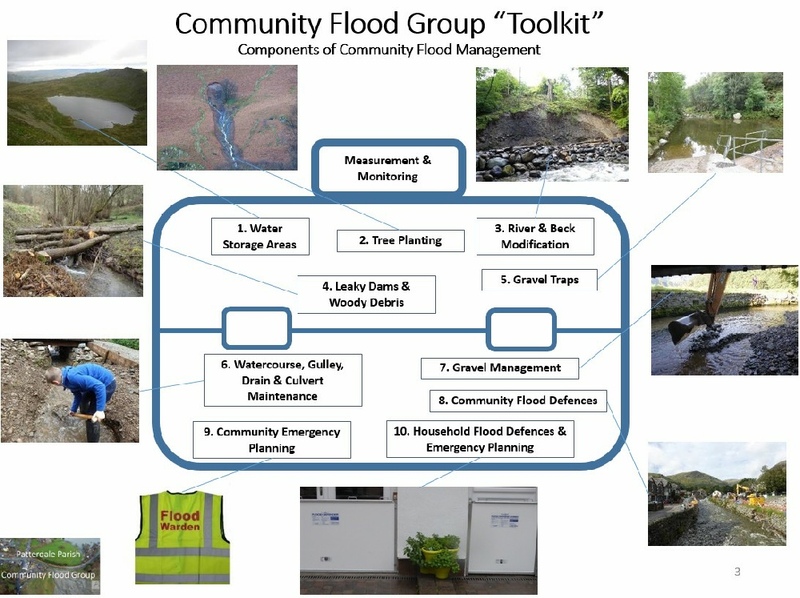 The key areas of the Community Flood Group are shown below, with the main contacts for each area. We are grateful for the support we are receiving from the relevant agencies and groups shown at the bottom of the page, especially the Cumbria Community Foundation and the work of the Cumbria Flood Partnership set up by our local MP Rory Stewart. Please “click” on each area for more details. The objective of our high level “toolkit” presentation is to outline the range of flood risk management options which we aim to implement in the Parish from “natural” flood risk measure to “hard” engineered solutions and including things that can be done at the individual household level to protect people and property. Click the image below to see the full presentation.